By the time the last polling booth closes on Nov. 4, a staggering amount of money — $4 billion, by one estimate — will have been spent on the midterm elections. What did all that money buy? A lot of false and misleading TV ads. Once again, we had no shortage of material for our annual Whoppers article. The candidates and their increasingly well-financed allies flooded the airwaves with ads accusing one another of dishonoring veterans, slashing Medicare benefits, threatening Social Security and lining their pockets with ill-gotten gains. The facts too often did not support the over-the-top rhetoric used by both sides. There were repeats from years past, including one that made our Whoppers list in 2006, as well as new twists on perennial topics, such as abortion and taxes. One Democrat claimed his opponent “proposed making women criminals for having an abortion,” even though the bill his opponent co-sponsored clearly stated a woman could not be prosecuted in “the death of her unborn child.” A Republican boasted that he “saved” 99 percent of taxpayers from “Obama’s tax increases,” even though he could only credibly claim to have “saved” at most 2 percent. For these and other examples of this year’s most common and wackiest misstatements, please read on to the Analysis section. By now, it’s routine for opponents of an immigration overhaul to yell “amnesty” at any supporter of a bill that includes a path to citizenship. There were many examples of that in this campaign cycle, too. But some candidates got more imaginative this year when it came to using the immigration issue as a blunt political weapon. For example, in the Republican primary in North Carolina’s 7th Congressional District, David Rouzer claimed Woody White is “part of a group that is pushing for amnesty.” Really? The short answer is: No. The long answer is more entertaining: White belongs to a lawyer’s association that advocated for driver’s licenses to be issued to immigrants who are in the country illegally, so they can purchase car insurance. But that’s not amnesty and, even if it was, White doesn’t even share the group’s position on driver’s licenses. There were some immigration chestnuts, too. Campaigns design attack ads to make voters think the worst of the opposing candidate, and sometimes those attacks are personal. 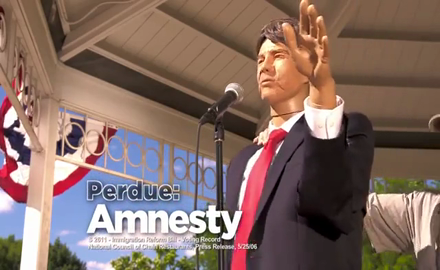 In Michigan’s 4th Congressional District Republican primary, state Sen. John Moolenaar accused businessman Paul Mitchell of “lining his pockets with Obama’s stimulus.” On the screen, viewers see stacks of bills and the words: “Mitchell took $100,000 from Obama’s stimulus.” The Moolenaar ad cited an unimpeachable source for the claim: recovery.gov, the government website for the American Recovery and Reinvestment Act. But there’s a lot less here than meets the eye. Michigan received funding to retrain laid-off workers, some of whom signed up for classes at a medical education center Mitchell once headed. The stimulus money helped pay for the tuition of laid-off workers who were seeking training in careers such as dental assistant and pharmacy technician; it did not go to line Mitchell’s pockets. In another GOP primary, this one in Pennsylvania’s 9th District, Rep. Bill Shuster accused his tea party-backed challenger, Art Halvorson, of “lining his pockets with taxpayer subsidies.” The ad said: “His farm in Iowa got half a million dollars.” That was not the case at all. Halvorson rents property to farmer Jon Charles Jacobson, who has received $423,019 worth of USDA subsidies over 18 years. 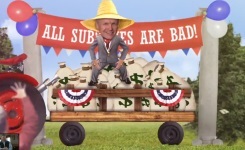 Jacobson received those subsidies, not Halvorson. And Jacobson told us he farms 700 acres and only a fraction of the subsidies he received came from farming that was done on Halvorson’s 40-acre property. In the Arkansas gubernatorial race, the Republican Governors Association claimed the Democratic nominee, former Rep. Mike Ross, got a “sweetheart deal” when he sold his family-owned pharmacy to a campaign donor in 2007. The ad cited a news story that was based largely on an independent appraisal of Ross’ pharmacy by Adam Guthrie Jr. The ad quoted Guthrie from a 2009 news story: “You can buy half the town for $420,000.” But Guthrie’s appraisal of the Ross pharmacy was discredited by state regulators, and Guthrie surrendered his license in 2010 rather than face disciplinary action by the Arkansas Appraiser Licensing & Certification Board for his appraisal of the Ross property. Also, the House ethics committee cleared Ross of any wrongdoing, saying the buyer paid fair market value for the pharmacy. The ad ignored all that. This year, we likened claims designed to scare seniors to ghost stories — both frightening and fanciful. And they were plentiful, too. In the first nine months of 2014, $50 million had been spent on TV ads that mentioned Medicare, with Democrats outspending Republicans nearly 2 to 1, according to Kantar Media Intelligence’s Campaign Media Analysis Group. That’s about 112,000 spots, and the numbers don’t even include ads about Social Security, the other major senior-scare topic. In many cases, the claims were the same old scare tactics. In several Senate and House races, Democrats claimed Republicans would “end the Medicare guarantee,” a reference to the candidates’ support for Rep. Paul Ryan’s Medicare plan and a version of the “end Medicare” whopper that has been around since 2011. 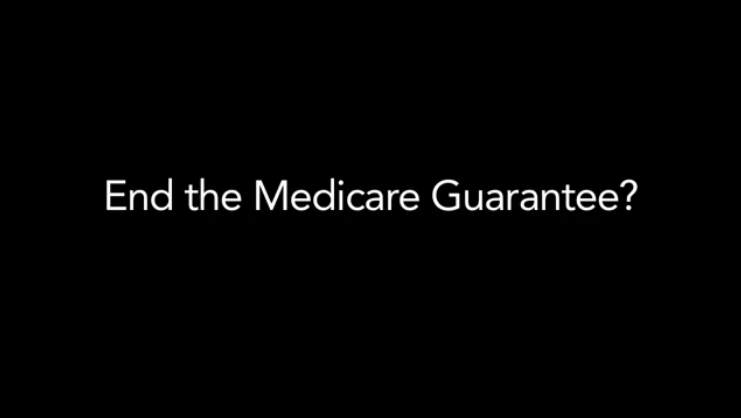 Ryan’s plan wouldn’t end the guarantee of Medicare, or Medicare benefits, as some ads claimed. Instead, it proposed phasing in a government-subsidy program in which future beneficiaries pick from traditional Medicare or private insurance plans, which must offer the same benefits as traditional Medicare. Other Democratic ads, such as one from Alison Lundergan Grimes attacking Republican Sen. Mitch McConnell in the Kentucky Senate race, recycled the outdated claim that Republicans supporting Ryan’s plan would increase Medicare costs by $6,000 per beneficiary. That’s based on a Congressional Budget Office analysis of Ryan’s 2011 plan. Ryan’s subsequent proposals were more generous in terms of the growth of subsidies, and his current proposal is actually modeled on a plan that CBO says would lower seniors’ premiums and costs by 6 percent on average. The CBO also now says its 2011 report was a “rough analysis” based on assumptions that have proven invalid. Other Democratic claims exaggerated the impact Ryan’s plan would have on seniors’ prescription drug costs. Republicans, meanwhile, continued to push the old, misleading claim that the Affordable Care Act would cut Medicare by $716 billion. That’s a reduction in the future growth of spending over 10 years, not a slashing of the current budget. The National Republican Congressional Committee led the charge on this talking point, making the claim in ads in several House races. Most of the reduction in Medicare spending is in the growth of future payments to hospitals, a move that extends the life of the Medicare trust fund. Political ads designed to scare seniors to garner their votes usually include images of elderly men and women, even though the claims being made pertain to proposed changes that wouldn’t affect seniors today. In the Arkansas Senate race, for example, an ad from Crossroads GPS attacking Pryor showed an image of a senior man while saying the Democratic incumbent “suggested raising the retirement age” for Social Security. He did — but for those who are now teenagers, not the man pictured. The whoppers in Kentucky and West Virginia were often fueled by America’s No. 1 energy source, coal. The House Majority PAC, a super PAC dedicated to returning the Democrats to power in the House, got things started early — way back in March — with a TV ad in West Virginia’s 3rd District that falsely claimed Republican Evan Jenkins “vowed to repeal black lung benefits.” Jenkins vowed to repeal the Affordable Care Act, not end black lung benefits. A repeal of the ACA would make it more difficult for some miners and surviving spouses to prove eligibility for the Federal Black Lung Benefits Program. But that would not repeal the benefits, which were created under a separate law. Six months later, Rep. Nick Rahall doubled down on the black lung benefits claim. 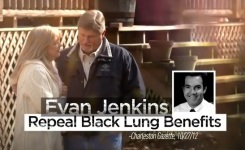 His campaign ran an ad saying Jenkins pledged to “take away” black lung benefits. “When I hear Evan Jenkins say that he’s gonna take away our black lung benefits, it just bothers me to no end,” a coal miner said in the ad. Jenkins said no such thing. To the contrary, Jenkins says he is “firmly opposed to any cuts to the Federal Black Lung Benefit Program.” Rahall’s campaign was putting words in Jenkins’ mouth. In the Kentucky Senate race, Grimes accused McConnell and his wife of “personally” taking “$600,000 from anti-coal groups.” Viewers wouldn’t know this from the ad, but Grimes was primarily talking about money from Wells Fargo. Yes, the bank. Elaine Chao, McConnell’s wife and a former secretary of labor, sits on the Wells Fargo board of directors — for which she has been paid $684,000 over the last three years. It’s true that Wells Fargo — five years before Chao joined the board — decided not to extend credit to mountaintop removal projects or to coal companies that receive a majority of their coal production from mountaintop removal. But it’s also true that the bank still lends billions to coal companies. In fact, the environmental Sierra Club gave it a “D” rating this year for its involvement in financing coal-fired power plants in 2013. Not to be outdone, the McConnell campaign claimed to show “shocking” video evidence from Grimes’ “own staff” that proves “Grimes is lying” about her support for coal. Spoiler alert: There is no smoking gun. None of those featured in the ad is a paid staffer with the Grimes campaign, and all of them are expressing their personal opinions — not revealing campaign strategy. The Grimes supporters were surreptitiously videotaped by conservative activist James O’Keefe’s Project Veritas Action Fund as they were meeting with undercover actors who posed as liberals concerned about Grimes’ coal-friendly statements. The McConnell ad says “Grimes is lying,” but ignores the possibility that the supporters shown in the video are just telling the undercover actors what they think the actors want to hear. What list of campaign whoppers would be complete without claims about Obamacare? In this election, we saw efforts to paint Republicans as supporters of the Affordable Care Act, even though they weren’t. And, as in past elections, we saw conservatives offering misleading attacks on the law. In the most interesting twist, the Democratic Senate Majority PAC ran an ad that could have been mistaken for a product of the Koch brothers from the way it disparaged Obamacare. The TV spot claimed that Cassidy, the Republican running for the Senate in Louisiana, sponsored a bill while in the state Legislature to create “government-run health care” in Louisiana. Cassidy did nothing of the sort. His 2007 bill, which never made it out of committee, called for setting up a state insurance exchange to serve as a clearinghouse for insurers and potential customers. The ad also claimed Cassidy argued for “automatic Obamacare registration,” but he actually called for repealing the ACA and enrolling the uninsured in a scaled-back GOP alternative. In Georgia’s 1st Congressional District, Bob Johnson and Buddy Carter – who were rivals for the GOP nomination – ran deceptive ads in which each portrayed the other as a closet fan of Obamacare. A Johnson TV ad quoted Carter as saying Obamacare is “not so bad.” Carter said that “some of the things that have happened so far are not so bad,” but he immediately added that “the worst part is yet to come.” Carter, meanwhile, blasted Johnson for “membership in and endorsement from groups that support Obamacare.” Dr. Bob Johnson is a member of the American Medical Association, but he disagrees with the AMA on this issue. Needless to say, both have called for repeal of the law. The Koch-backed Americans for Prosperity made canceled insurance policies a theme of its ads, with one series of TV spots against Democratic senators claiming, “Millions of people have lost their health insurance.” Insurance companies did discontinue policies that had covered millions who bought the plans directly, rather than through an employer. Those plans didn’t meet the minimum benefit standards of the law. But those policyholders didn’t lose the ability to have insurance. In most cases, insurers offered them an alternative plan, and in other cases, individuals could buy coverage on state or federal marketplaces, many with the help of federal subsidies. In fact, there is evidence that far more have gained coverage than had their policies canceled. Other Republican ads claimed that premiums or health costs were “skyrocketing” under the ACA. That’s misleading. Employer-sponsored premiums, where most Americans have coverage, have been growing at historically low rates in the past few years, as have overall health care costs. Premiums for those who buy their own private insurance will go up or down, in some cases significantly, depending on individual circumstances: For instance, those with health conditions would likely pay less than they did when their health status was a pricing factor, and the reverse is likely the case for healthy individuals. Democrats and Republicans tried to capitalize on public anger over the VA hospitals scandal by wrongly accusing their opponents of neglecting veterans by voting to cut their benefits or skipping important hearings on veterans-related issues to raise campaign cash. 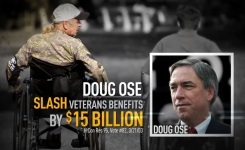 Back in June, the House Majority PAC accused California Republican Doug Ose of voting “to slash veterans benefits by $15 billion” in 2003, but actually he voted for a nonbinding budget resolution that proposed a 5.4 percent increase in new spending authority for veterans benefits and services for fiscal year 2004. Democrats claimed the bill contained a $15 billion cut because the House Republicans’ budget proposed a smaller increase in spending authority for veterans benefits than President Bush’s budget. Bush had called for a 6.6 percent increase compared with the 5.4 percent contained in the House measure. Those ads aired before former Republican Rep. Bobby Schilling ran a TV spot featuring four Army and Navy veterans scolding Democratic Rep. Cheri Bustos for $6 billion in cuts to “veterans benefits” that never happened. What Bustos initially voted for last December was a bipartisan budget to avert another government shutdown that also reduced future cost-of-living adjustments to the pensions of working-age military retirees by cutting spending by an estimated $6.2 billion over 10 years, beginning in fiscal year 2016. But the pension cut quickly drew fire from military and veterans groups, and members of the Senate and the House, including Bustos, voted weeks later to repeal the cut and restore the old cost-of-living formula for all who had signed up for military service prior to 2014. And Concerned Veterans for America got in on the deception with an ad that falsely claimed Iowa Rep. Bruce Braley “skipped an important VA reform hearing to attend three fundraisers.” In fact, none of the three fundraisers that Braley attended was scheduled at the same time as the House Veterans’ Affairs Committee hearing that he missed that day. The Braley campaign has said that the congressman missed the VA committee hearing because he was attending a House Oversight and Government Reform Committee hearing that was taking place at roughly the same time. The official transcript shows Braley was present for the oversight hearing. But it is not known for how long, and his campaign wouldn’t say. Nothing, the saying goes, is as certain as death and taxes. To that we might add “and misleading political ads about taxes.” As usual, 2014 campaigns have been filled with bloated boasts about tax cuts and off-base accusations that an opponent has raised taxes. The bipartisan deal reached on New Year’s Day in 2013 to avoid the so-called fiscal cliff provided plenty of ad fodder for both sides. Known as the American Taxpayer Relief Act of 2012, the compromise agreement permanently extended Bush-era income tax cuts for everyone except for individuals making more than $400,000 and couples making more than $450,000 a year. That led to a grossly misleading boast by McConnell, the Senate minority leader from Kentucky, who voted for the bipartisan deal. 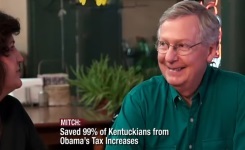 McConnell claimed he “[s]aved 99% of Kentuckians from Obama’s Tax Increases.” But Obama’s plan would have extended the Bush-era tax cuts for those earning up to $250,000 for families ($200,000 for individuals). In other words, McConnell can only credibly claim to have “saved” individuals with taxable income of between $200,000 and $400,000 and couples who earn between $250,000 and $450,000. That’s about 1 percent to 2 percent of Americans. Interestingly, that same fiscal cliff vote was used as the basis for an ad from McConnell’s opponent, Grimes, who claimed McConnell “even voted to end the payroll tax credit.” It’s true that a temporary payroll tax holiday was allowed to expire in the fiscal cliff deal. But no one really pushed for extending the payroll tax holiday, not even Democrats who had proposed it two years earlier as a form of temporary recession relief. All but three Senate Democrats voted for the fiscal cliff bill, and the expiration of the payroll tax holiday was even supported by the likes of Obama’s treasury secretary, Timothy Geithner, and Nancy Pelosi, the top Democrat in the House. The fiscal cliff deal McConnell voted for was praised by Obama, who even thanked McConnell by name for supporting it. On more than one occasion, Republicans and their allies labeled vulnerable Democratic senators champions of a carbon tax without evidence. One particularly egregious example: A Crossroads GPS ad said Colorado Sen. Mark Udall “voted to enact a carbon tax.” He did not. The ad refers to a vote on a failed amendment to a nonbinding budget resolution. The amendment would have required any possible future carbon tax to be revenue neutral, with the tax proceeds being returned to the American people. We saw similar bogus attacks on Sens. Kay Hagan of North Carolina and Mark Begich of Alaska. And, in what ended up being the most shocking upset of the political year so far, Rep. Eric Cantor of Virginia lost his primary to upstart Republican David Brat, despite Cantor repeatedly portraying Brat as a “liberal college professor” who advised then-Democratic Gov. Tim Kaine on a massive tax hike plan. Cantor distorted Brat’s role on the Joint Advisory Board of Economists, a large board of unpaid technical experts that was narrowly tasked with providing professional economic forecasts. Advice on tax policy was not part of the job description. The liberal Senate Majority PAC claimed in a TV ad to “connect the dots” on Rep. Tom Cotton’s career. Cotton was “paid handsomely working for insurance companies” before joining Congress, the ad said, and he has paid them back in Congress by supporting the industry’s agenda. There is one problem with this theory: Cotton didn’t work for any insurance companies. His only established connection to the industry involved consulting work for the Federal Housing Administration. Conversely, Cotton made the curious claim that President Obama “hijacked the farm bill, turned it into a food stamp bill.” That was his defense for being the only member of the Arkansas delegation to vote against the bill. But food stamp funding has been part of farm bills going back to 1973. 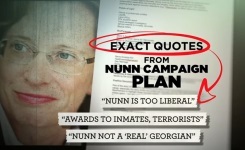 In the Georgia Senate race, Republican David Perdue cited a campaign strategy memo from Michelle Nunn’s advisers to make the audacious claim that “her foundation gave money to organizations linked to terrorists.” She “admits” it! It’s right there in the campaign memo! Except it’s not. The memo doesn’t “admit” anything. It was meant to prepare “responses to potential Republican attacks,” as it said. It didn’t say those attacks would be accurate. And there’s no evidence that the foundation — Points of Light, the volunteer group founded by former Republican President George H.W. Bush — gave money to any group linked to terrorists. Most attack ads appear in competitive races, but long-shot Democratic challenger Jim Mowrer in Iowa’s 4th Congressional District ran a TV ad that claimed Rep. Steve King voted to “raise his own pay by $20,000 a year and take perks like free health care for life.” Mowrer is doubly wrong. The $20,000 figure is about how much congressional salaries automatically have increased for cost-of-living adjustments since 2002, when King was first elected. King did not vote to raise his pay — let alone “by $20,000 a year.” He also didn’t vote for “free health care for life.” King voted for a House budget resolution that urged the repeal of the Affordable Care Act. But if that happened, members of Congress would return to the Federal Employees Health Benefits Program, which is not free. Editor’s note: Did we miss one of your favorite whoppers? Let us know which one. Tweet us at @factcheckdotorg.